Home Blog Tyrone Bell: Muscle Intelligence – What Are Dropsets? Tyrone Bell: Muscle Intelligence – What Are Dropsets? Dropsets are where you perform a set of an exercise to failure, or close to failure, with a given load and then immediately reduce the load and continue to crank out more reps until you hit failure again. An example of this would be if you were performing bicep cable curls. You perform 10 reps, hitting failure on the 10th. Then, instead of just calling it a set, you drop the weight down and continue the set again for another set amount of reps. The idea behind dropsets is to be able to reach failure multiple times in a single set. This technique can be applied to any weighted exercise and can be done with more than one reduction in weight. Failure can be reached several times in a set if structured correctly. Why Should I Use Dropsets? As you already know, intensity is arguably the most important variable for stimulating muscle growth. Dropsets are a tool to help exactly that – intensity. It’s important that we understand what dropsets do on a deeper level than just being able to explain that it increases intensity. Let’s use this example: you’re doing biceps curls with 50 kilos for a set of 10-12 reps. The 10th rep is difficult. The 11th rep – extremely hard. The 12th rep takes everything you’ve got left. And then there’s no way in hell you can even attempt a 13th rep. You’ve hit honest failure. But if you strip some weight off the bar and get back into the set, you can keep going. Even though you reached a point of momentary muscular failure, you haven’t reached absolute failure. You’ve only reached failure with that weight. You see, in a single straight set performed at failure, you don’t activate every fiber in the targeted muscle group. Your body only recruits the number of fibers necessary to lift that particular weight for the desired number of repetitions. By stripping off weight and continuing the set, you accumulatively recruit more and more muscle fibers – muscle fibers that you normally wouldn’t hit with just a straight set. It’s also valuable to understand that this accumulative recruitment of muscle fibers allows us to maximize the benefits of both load and time under tension. That means we’re going to be tapping into not just our fast-twitch fibers but also our stubborn, slow-twitch fibers. See, lifting heavy on the first portion of a dropset demands a high level of muscle activation so your body will have to recruit and tap into your fast-twitch fibers. As you work your way through subsequent drops in weight, we’re going to be recruiting more and more muscle fibers because you’ll be providing greater time under tension than if you stopped after one set. This also means that as time under tension continues, eventually our stubborn type 1 fibers will be getting the stimulus they need to grow as well. And, as if things couldn’t get any better, just know that the increased fatigue we experience will act as a safeguard to ensure you’re really hitting those type 2 fibers. Fatigue can actually make it easier for your body to recruit type 2 fibers at a lighter weight when they normally wouldn’t be required to. All these factors ultimately add up to greater muscle fatigue than a standard straight set, heightened metabolic stress, which can help to enhance the metabolic environment, as well as significant spikes in growth hormone levels. How Do I Use Dropsets? As mentioned before, you can apply dropsets to any weighted exercise. Machine-based exercises are by far the easiest from a practical point of view. You just have to pull out a pin to change the weight and don’t even have to get out of position compared to pulling weights off barbells. Next, how much weight do you need to drop? This varies on the targeted rep range. Let’s use eight reps as an example. On average, you’ll drop 15-20%. If you’re looking for a high repetition per drop, a larger percentage drop will be needed. It really comes down to your strength level. Keep rest intervals to a minimum. Usually the time between weight drops ranges from 0-10 seconds, but the briefer the time between the weight change, the more intense and effective your dropset will be. Set up your equipment in advance. To move quickly from one drop to the next, you should have all your equipment set up before starting the first exercise. Instead of putting big plates on a barbell or machine, load it up with fives and tens, ready to be stripped. 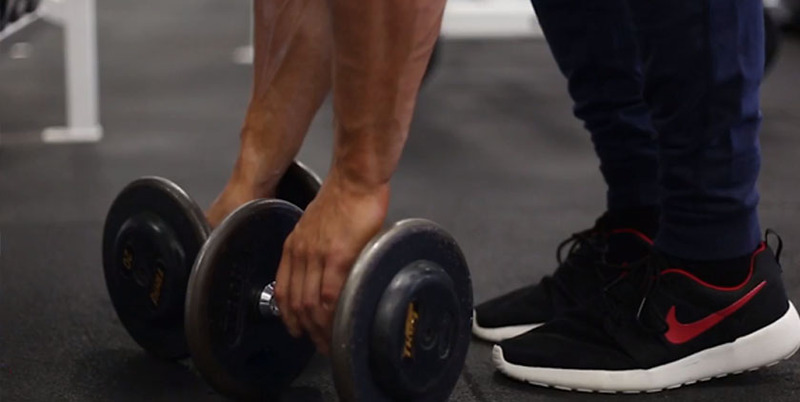 If you’re doing triple drops with dumbbells, line all three pairs up beforehand. Use two weight drops. Most of the time, you can really go crazy with dropsets and reduce the weight as many times as you want. However, there seems to be a point of diminishing returns after two or three weight reductions. The most common dropset method is a triple drop where you use three weights and two weight reductions. Live close to failure. If you start with a weight that is too light, you’ll achieve little more than a muscle pump with the dropset technique. To take full advantage of the enhanced muscle fiber recruitment, you should reach failure, or close to it, with each weight before dropping down to the next weight set. Use dropsets sparingly. Dropsets are intense and they require caution and common sense. If you use them all the time, you’ll quickly be burning out and overtraining. A great way to use dropsets is a 3:1 method. Perform three straight sets of an exercise followed by one dropset.